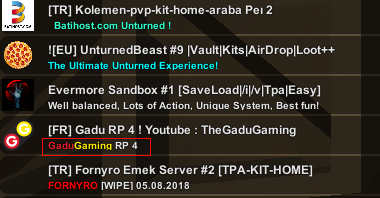 Hello, I want to set a description for my unturned server in Global Serverlist. Desc_Full is working but the Server list not. What can i do? DiBaDu Rich text is most likely not supported there then. I can confirm the description supports Rich Text. I have it on my servers, I don't believe you can just use words like red, yellow and such, I have mine set as a Hex Code, so try using a hex color code and see if that has any effect. I used that also on my Server.